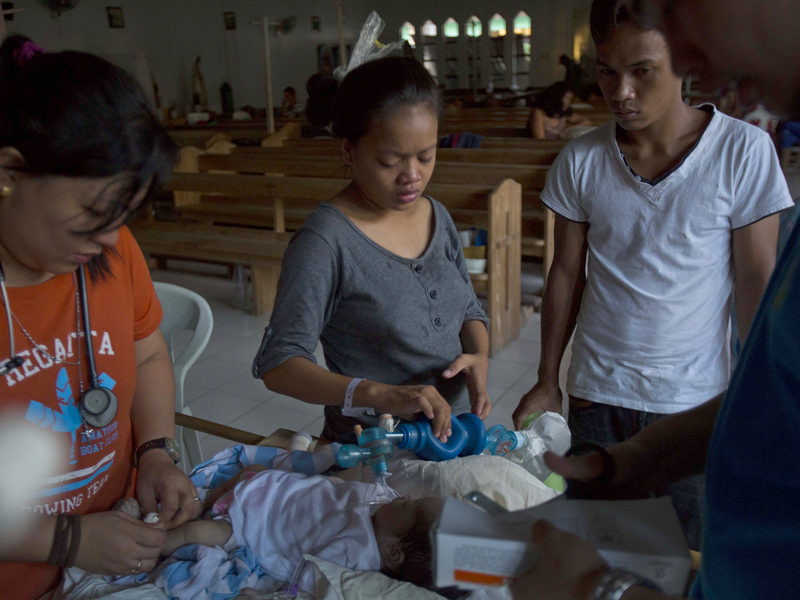 TACLOBAN, Philippines All through her very short life, the parents had squeezed oxygen into her tiny body with a hand-held pump to keep her alive. In the end, their prayers and whatever little medical care doctors could muster in the typhoon-ravaged hospital were not enough. Althea Mustacia, aged three days, died Saturday. She was born on Nov. 13, five days after Typhoon Haiyan annihilated a vast swath of the Philippines, killing thousands. The storm's aftermath is still claiming victims, and Althea was among the latest. As the Asian island nation struggles to recover from the record-setting storm, President Benigno Aquino III said Sunday that he will stay in typhoon-battered Leyte province until he sees more progress in the aid effort following complaints from survivors that they have yet to receive proper help. Aquino is expected to set up camp in Tacloban, the capital of hardest-hit Leyte province, but it is not clear where he will find suitable accommodations amid the ruins. Virtually every building in the city was damaged or destroyed by the Nov. 8 Typhoon Haiyan, which left about 1,200 people missing, and killed 3,974 people, according to the latest official count released Sunday, including tiny Althea Mustacia. She was born at the government-run Eastern Visayas Regional Medical Center, suffering from a condition called newborn asphyxia, a failure to start regular breathing within a minute of birth. The consequences are possible brain damage or death if not corrected quickly. According to the World Health Organization, newborn asphyxia is one of the leading causes of newborn deaths in developing countries, accounting for about 20 percent of the infant mortality rate. In the United States, it is the 10th leading cause of infant mortality. Althea could have been saved had the hospital's ventilators had been working. But power lines were down in the entire region. There was no electricity and none of the equipment in the hospital - flooded and wrecked - worked. Not the ventilators, not the incubators, not the suction pumps to feed her oxygen. Instead, her parents had to push life into her mouth with a hand-held pump connected to an oxygen tank. They took turns to do this continuously since she came into this world without stopping. With her lungs barely functioning, the only sign of life in the infant was a heartbeat. But Althea's fragile body could not cope. Even the heartbeat stopped on Saturday evening, a few hours after an Associated Press team visited the hospital. The attending physician, Dr. Leslie Rosario, told the AP that her parents wrapped her body in a small blanket and left in tears. She said the storm had not been a factor in the baby's problems, noting that insufficient prenatal care most likely complicated the pregnancy for the 18-year-old mother. The baby was not born premature. Althea was one of the 24 babies at the hospital's neo-natal ward, which had to be shifted from the ground floor to a chapel one story above because everything on the bottom floor had been ruined by the storm. Electricity is available only in small pockets of the region through diesel generators. There is no running water, and people must manage with water supplied by tankers. Many don't even have that. Speaking to reporters during a visit to Tacloban, President Aquino said that while there has been some progress in the aid effort, it is not enough. A massive effort by the international community, which has donated aid and cash worth more than $248 million, is beginning to show improvements on the ground. "We really want to ease the burden of everybody as soon as possible. As long as I don't see any more improvements, we'll stay here," Aquino said, referring to his official team. Presidential spokesman Ricky Carandang said Aquino wanted to ensure that the distribution of relief goods goes on smoothly and power is restored soon in this city of 220,000 people. There are estimated to be about 500,000 homeless due to the storm. In hard-hit Tacloban, at least a thousand of the homeless are living in one single school. CBS News correspondent Seth Doane visited the high school, and reports Alejandro Devaras was once the facilities manager there, but now he's running it as a camp for the displaced. One classroom now houses four families. Laundry hangs near the chalkboard. Science tables have been turned into beds. Four years ago, Marvin Galvez was a student in this very room. Describing how it is living there, he said: "It's very had because we're sleeping in this floor, it's cold -- especially in the morning. The smell of dead people." Galvez waited in line for an hour to get rice from a World Programme distribution site set up just out front. "What they need is food and water," said Devaras.